Thursday, March 13, 1913: Nothing doing. I’ve been reading some Edith Wharton books from the early 20th century—and one of the themes in her writing is unhappy marriages and the role of divorce. This made me wonder if divorce rates have changed much across the years. 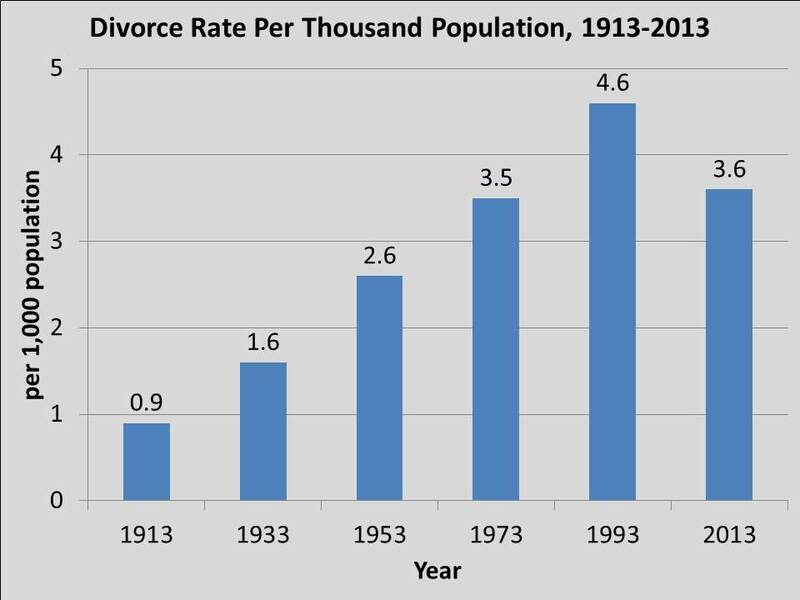 The divorce rate was 0.9 per thousand population in 1913. It peaked at 4.6 in 1993; and decreased to 3.6 in 2013. For those of you who care about the source of the data–The historic data is from Infoplease, and the data for the current year is from the Centers for Disease Control and Prevention. If data for the exact year were not available, I used data from the nearest available year (typically the first year of the decade–for example, I used 1910 data for 1913). Posted on March 13, 2013 March 12, 2013 by SherylPosted in StatisticsTagged 100 years ago, 1913. I always love statistics and polling. I guess it is in the blood since I am related to Gallup :-). Have you read any Dorothy Whipple? Similar themes. I haven’t heard of her–but I googled her name and she looks like an author I’d enjoy. I’ll have to look for her books. Thanks for the suggestion. Interesting. My parents were married in 1929 (they were married quite a while before I was born! ); I was shocked to learn that my dad had been divorced from his first wife. With time, we have not gained much wisdom have we? – or maybe we have. The statistics reveal an awful picture – or do they? Divorce was less common, in England, during the 19C because it was very expensive, I understand… The unwealthy (like some of my Ancestors) never divorced, they just “split” and the next woman took the man’s name, claimed she was his wife, and the children were named after him. Can be frustrating and I suspect is why I can’t find what happened to my Great Grandfather’s first wife. She didn’t die… well, she didn’t die under her birth & married name and there’s no second marriage recorded for her. Great Grandfather never married my Great Grandmother and originally their son (my Grandfather) took her maiden name, as his surname… by the following Census, when they had both moverd in with him, (10 years later… prior to that they were just “visiting”) Grandfather had taken on his father’s name. Whew, it sure can add a lot of complexity when researching family history. It’s really interesting how families were sometimes formed and dissolved back in the old days. I’ve found cases where the wife is listed as a widow but the husband is in a different town, remarried. Interesting. . . If was so different in back in the days before computers and modern communication. I wonder if the women had any idea that their husbands had deserted them or if they just assumed their spouse had died when they vanished. I thought maybe they didn’t want to tell the census taker, or others, that their husband deserted them so they just said he was dead. My grandmother was in the unusual early percentage, and I’m glad ahe divorced him…the archive docs re sad. Like Kristin, I feel I may have a widow who wasn’t. I expected that today’s rate would be the highest. Glad to see it’s gone down, if not just a little. Also, she said “nothing doing”! One more thing…she just barely avoided a Friday the 13th…LOL ‘kay I’m done with my quirkiness. For this post. Thank you! I am doing a college paper and I needed this information ASAP! Your site was an immediate help and when I am done with it, I am going back in here to look at the other 100 years ago… stats, they do look very interesting. I’m glad this site was helpful. Best wishes–I hope that you get an A on your paper.